Bat populations in North America, and here on the Bruce, have a number of pressures on them. Migrating south at night from August to October and returning north in May, Red Bats and Hoary Bats (and now Silver-haired Bats), in additional to all of the normal migratory stresses, are particularly susceptible to being killed by wind turbines. With an increase in wind-produced energy, these bats are also at increased risk. Research into bat migration patterns on the Bruce Peninsula should help inform decisions on where to locate wind turbines in the future. Since 2006 in the USA, and the spring of 2010 in Canada, a new pressure on bat populations has been identified. Called “white nose” syndrome, after the white fungus found growing around bats’ muzzles, this often-fatal condition is being found in an increasing number of bat caves in northeastern North America. The fungus causes bats to awaken from hibernation, using up energy otherwise needed for continued hibernation. This dooms the bats to almost certain death. The condition can kill up to 90% percent of bats in a colony, and poses a huge threat to bat populations in general. Some experts predict that the now common Little Brown Bat may be extinct in as little as 20 years. We can expect an increase in insect pests as bat numbers rapidly decline, with humans and agriculture directly impacted by this dramatic change. MNR Science Specialist Lesley Hale swabs the muzzle of a Northern Long-eared Bat to test for the presence of “white nose syndrome”, which may cause some bat species to go extinct in the near future. Studies are currently under way on the Bruce to generate this important data and to more clearly understand population trends. Lesley Hale, a Science Specialist (Renewable Energy) with the Ontario Ministry of Natural Resources, and in partnership with Bird Studies Canada, is currently resampling local bat populations. Test mist netting of bats is currently underway at the Cabot Head Research Station, and after only the first night (August 25/26) of monitoring, the Silver-haired Bat has been confirmed as a species for the Bruce Peninsula. Lesley will also visit local bat hibernacula, along with National Park staff, to check for the possible presence of white nose syndrome. Future MNR plans for bat studies on the Bruce include using radio telemetry tracking to more clearly define bat migration routes. At the same time, Rachel Hamilton, a Masters student with bat expert Brock Fenton at the University of Western Ontario, is using acoustic monitors to determine what area of the Peninsula bats are using for migration. As of this date, four monitors have been set up, including one on the observation tower of the National Parks Visitor Center and one in my yard at Cape Hurd. Rachel hopes to have 16 monitors in place by next year; six along the Huron shore, six down the center of the Peninsula, and six along the Georgian Bay shore. This will require partnering with additional people and organizations on the Bruce. Her hypothesis is that bats favour shorelines for migration, and that the center of the Peninsula is not as fully utilized. If proven by her study, this may well have implications for locating wind turbines. 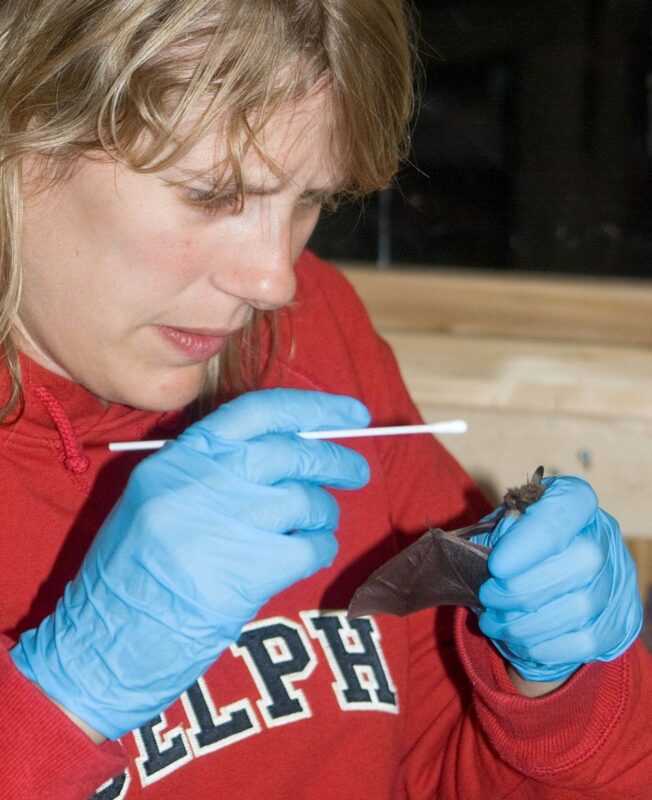 Bat populations on the upper Bruce Peninsula were first studied by Sandy Dobbyn during the summers of 1993 and 1994, as part of the “Bruce Peninsula National Park Mammal Inventory” (July 1996). Six species of bats were captured or identified during the study, using mist nets, Tuttle traps, and acoustic bat detectors. In addition to the migratory species mentioned at the beginning of the article, four other year-round resident species were also identified; the uncommon Eastern Small-footed Bat, Little Brown Bat, which we commonly have flying around our houses in the evening (at least for now), as well as Northern Long-eared Bat and Big Brown Bat. They begin hibernation some time in October and usually reemerge in May. Of the six species found in the area during the study period (and now seven species with the confirmation of Silver-haired Bat), Little Brown, Big Brown, and Red Bats were the most wide spread. Many people appreciate having bats around, both for their incredible dusk flights and for their work as a natural insecticide and can be encouraged to stay in the area by erecting one or more bat boxes. Many designs exist, and most work well. Despite folk legend, bats do not want to get into your hair, and if trapped in a building they just want to get out. Don’t take their frantic flight personally! We need bats, even if they are not everyone’s favourite animals! Hello Rod – I bat proof homes/cottages and humanely evict bats. I live in Hanover and have been quite amazed at the colonies of little brown bats I have seen from Tobermory down to Owen Sound. I worked on 2 houses in Kemble this year and between the 2 houses, there were at least 300 little brown bats. Hopefully this keeps up. That’s welcome news! I have seen exactly one Myotis bat (Little Browns & Northern Long-eareds) since spring. I’m glad they are hanging on somewhere. It might be worthwhile to forward the information, along with numbers of bats and general location (possibly exact location with owner’s permission) to the local MNR. They are monitoring this kind of thing. Leslie is off on maternity leave right now. I don’t have any contact information for whoever is filling in for her. We live in Tobermory. We are seeing bats flying at dusk for the first time this summer this week. So happy to see they are back. We saw one about 2 days ago crawl up into our bat box after coming down for a drink of water we think. So I hope that our bat box has a family group. Tonight we saw about 5 or 6 bats flying and about the same 2 days ago. So refreshing after seeing the bats out at 5pm in the winter and finding a dead bat on our driveway in early spring. Glad to hear that you have some bats around. I’m going to pass you comments about the unusual behaviour/mortality along to Cavin Harpur at the National PArk. He is keeping tab on sightings, etc. for the area. We live in miller lake and for the first time in 43 years that we have owned property, we have lost our bats. We saw one in May when we returned from down south for about two weeks. After that we saw nothing and have seen no bats since then. we checked with others down the lake from us and they too report not having seen any bats this year. Do you know if there is something we can do to get them back? Unfortunately, our bat populations are under extreme pressure from white nose disease. Predictions are that we may lose all of our bats within 10 years, which would be an ecological crisis, given that they are a major factor in insect control. I hope this is not what we are seeing with the bats in the Miller Lake area. I will pass you comments on to Leslie Hale, the MNR biologist who is studying white nose disease in Ontario. They checked out several roosting caves last year and didn’t find the disease, but it may have gotten to our bats late in the fall or over the winter. The disease is 85% to 95% lethal in a colony, and can sweep through several times, wiping them out. I am giving you the email of Leslie Hale, an MNR biologist who has worked a lot with bats. She may be able to provide you with the information that you have requested.